Returning from the South American winter to the heat of New York in late August, I imported a vicious cold, which I can just partly blame for the delay in publishing this post. My other excuses include a large backlog of work and personal duties, a small kitchen flood and other domestic irritants, time-consuming photo editing, and general procrastination. Still, the 11 days I spent traveling around Chile and skiing in the backcountry of the world’s highest mountain range outside of Asia were the experience of a lifetime that I won’t ever forget. Political graffiti on run-down buildings in central Santiago invoked deposed socialist president Salvador Allende, while the fascistic uniforms of the Carabineros were reminiscent of dictator Augusto Pinochet. 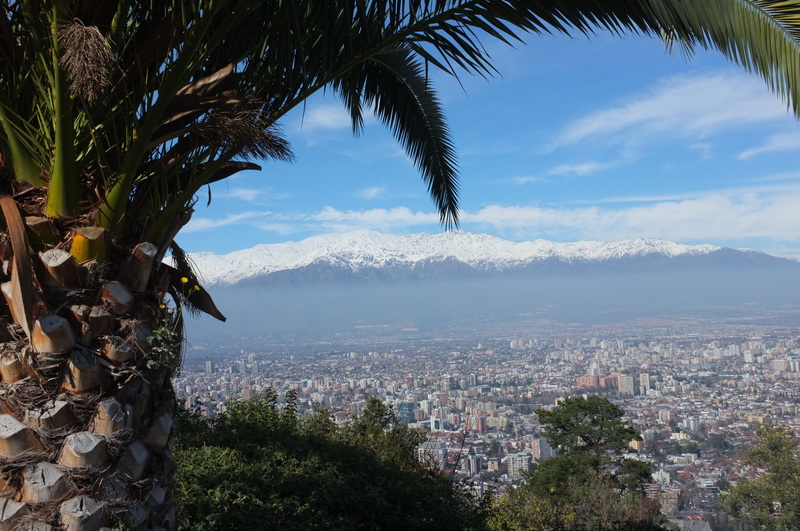 But Chilean politics were not on my agenda, so I toured the historic Plaza de Armas, peeked into the grand Catedral Metropolitana, and boarded the hop-on-hop-off bus for a spin around the urban sprawl. The malls and tony neighborhoods we passed held scant interest for me, and I had precious little time for museums (except the one specializing in pre-Columbian art, which was damaged in the earthquake of 2010 and shut when I tried to visit). But a sweaty, muddy hike up to the Virgin Mary statue atop the Parque Metropolitano rewarded me with spectacular vistas of the city. Exhausted, I retraced my route back to the airport, where I reclaimed my bags and checked into the ultra-convenient Holiday Inn. Days Two to Four The resort town of Farellones is less than 25 miles from Santiago, but because of the narrow switchback road the trip took more than an hour for our group of seven skiers, two guides and driver, hauling a trailer full of ski equipment and other baggage. We still had most of the afternoon left to warm up on our skis in the flat light of Valle Nevado and undergo the necessary avalanche training. Lucky for us, a recent storm had salvaged a hitherto woeful season – seemingly a continuation of what we suffered in much of the United States last winter — covering enough rocks for enjoyable skiing. With elevations and vertical drops similar to large resorts in the northern hemisphere, Valle Nevado, El Colorado and La Parva featured wide-open European alpine slopes (that is, above the tree line but sans glaciers) and the heavy snow associated with North America’s Pacific coast. My comparatively narrow all-mountain K2s and aching lower back would soon be put to the test, I feared correctly. Aside from the sluggish fixed-grip chairlifts that looked like hand-me-downs, we would depend on T-bars and Pomas. At El Colorado the next day, however, we made use of another conveyance: our Mercedes-Benz van. Beneath sunny skies, our lead guide Mo shepherded us under the rope and outside the ski area proper to some of the most wonderful terrain I’ve ever descended. Snow conditions were highly variable, ranging from dense powder to crud and crust, as we worked our way down to the paved road. There, our driver Fernando waited to shuttle us back to the base lifts. 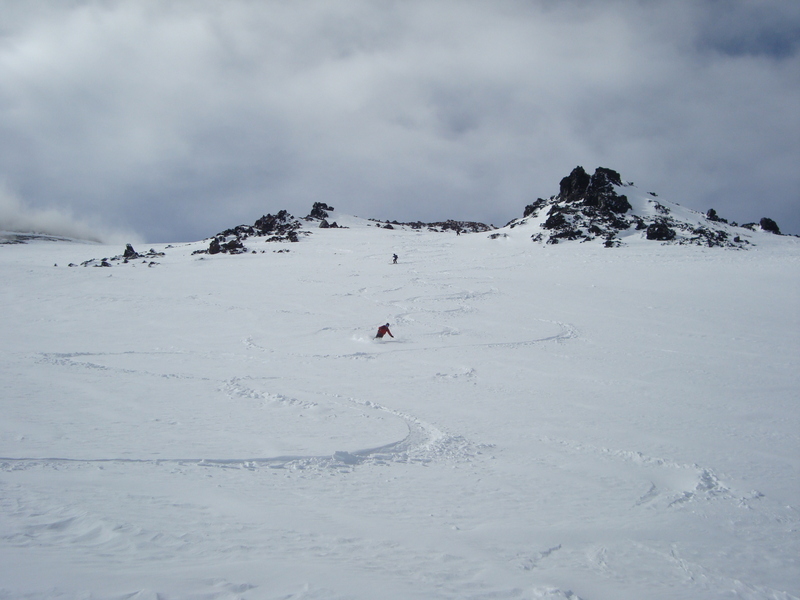 The highlight of the following day at La Parva was a steep ascent to ski some chutes and look for powder at higher elevations, made even more challenging by the need for most of us to carry backpacks laden with skis and avalanche equipment. Day Five We spent the prior night at a 19th-century hacienda turned hotel in Los Andes, about 50 miles north of Santiago on the main route to Argentina. The good news: another storm was tracking toward the mountains. The bad news: the road to Portillo was closed due to snow and wind. Instead of skiing at the legendary Chilean station, we went horseback riding at a mountainous local vineyard, viewing ancient native petroglyphs along the way. And ate a hearty traditional country lunch. Chile’s cuisine favors meat, although the country’s long coastline provides ample seafood for ceviche (a Peruvian import) and other dishes that I prefer. The churrasco, grilled beef on a bun, is a guilty delight with or without cheese; my order tended to feature chicken, plus tomato and avocado. Their fruits and vegetables grace North American tables during the winter, but the Chileans don’t appear to bring in our summer produce. The local carmeneres and cabernet sauvignons are good all year round to wash down the most filling of foods. We ate all of our meals as a group, including the sole “pescatarian,” and drank plenty together. The pisco sour (another gift from Peru) was our cocktail of choice. Day Six Arpa cat-skiing more than compensated for our Portillo disappointment. 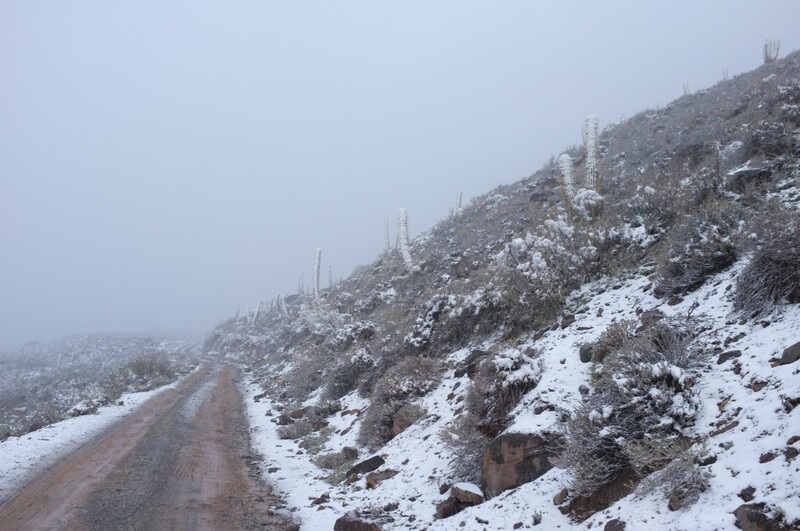 The trip of scarcely more than 20 miles by four-wheel-drive vehicles brought us through an otherworldly landscape of cacti coated in fresh snow, followed by a white-knuckle climb of hairpin turns to the Arpa lodge at an altitude of almost 9,000 feet. 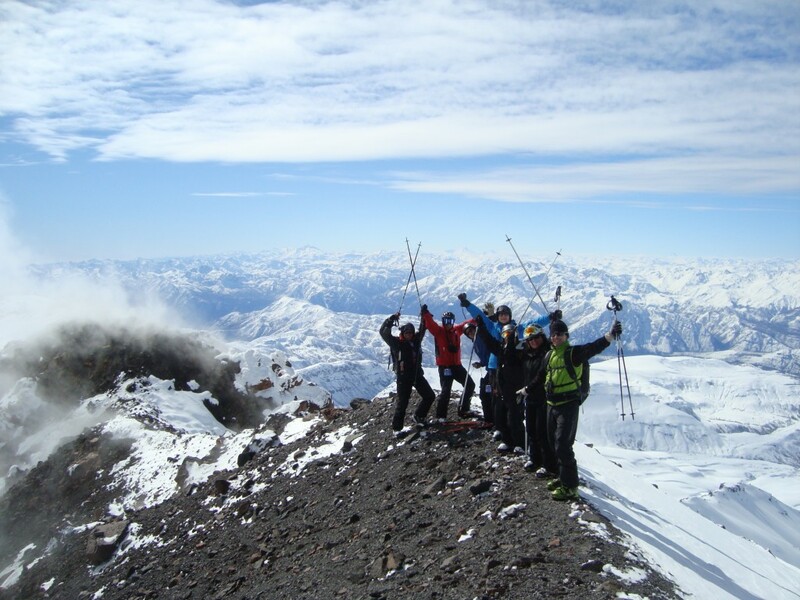 With Aconcagua – whose summit elevation of close to 23,000 feet makes it the Americas’ tallest peak – in the background, we combed the all-natural snow on five cat runs (with most of us opting to pay extra for the fifth). Days Seven to Nine The trip from Los Andes to Chillan, more than 200 miles south of Santiago, took all day. In a country nearly 2,700 miles long, we traveled less than half the way to Patagonia. The deeply rutted side road to our hotel hadn’t been cleared of the latest snowfall, forcing our driver to hook up chains on the drive wheels. But the minor ordeal was well worth it. 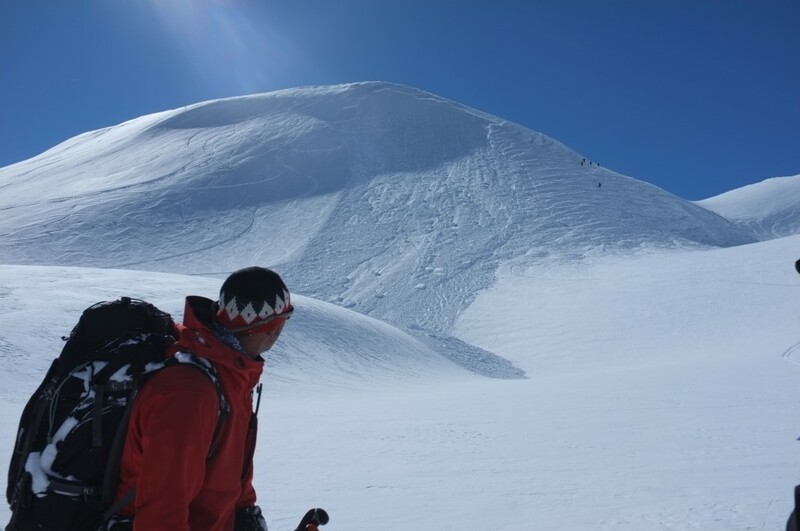 Although significantly lower in top altitude than its Farellones siblings, Nevados de Chillan boasted contoured lift-serviced terrain, smoking fumaroles and treed runs at lower elevations. I dare say that, under proper ownership, it could be one of the great ski resorts of the world. A local shop even repaired my rock-damaged bases overnight at a very reasonable cost. In the morning, we rode the old, slow lifts and explored the groomed and off-trail acreage under a warm sun. Then we hired a snow cat to ferry us up the side of one of Volcan Chillan’s two active cones, where we hiked up to the rim. This, and the descent of more than 5,000 feet that followed, must rank as the highlight of the trip. We posed for a photo on the edge of the crater, volcanic fumes and Andean peaks as our backdrop. On the way down through out-of-bounds land, Mo triggered an avalanche on one of the steeper pitches but managed to ride it out. With some trepidation, we detoured around the slide debris and carried on safely to the base. Our last day of skiing was slightly more mellow yet still involved a remarkable out-of-bounds circuit that I pushed myself to do twice, despite the chills and aches of a nascent viral infection. Nearing 56 years of age, would I ever ski here again? Day Ten The group of seven skiers, all but one native to North America, ranged somewhat in age (from 36 to 60 years old), physical fitness, and technical ability. With a little patience on our part, this caused no problems on the mountain that the guides couldn’t manage. Yet the sole female in the group had taken a disliking to me, and fortunately waited until the voyage back to Santiago airport before erupting. After stopping to visit the colorful Chillan market, we traded barbs at lunch. She proceeded with a full-blown lambasting, calling me “skinny,” an “ugly American,” and wishing colon cancer on me. Well, at least I don’t have to worry about her and her husband looking me up on their next trip to New York. Needless to say, the van’s cabin was quiet until we reached our destination and (selectively) bid our farewells. Day Eleven Having stored my ski equipment at the airport the night before, I was picked up at my hotel by a local guide for an excursion through the Casablanca wine country to the Pacific coast. After I visited Pablo Neruda’s fascinating homestead at Isla Negra, we talked about his friendship with Federico Garcia Lorca, of the Chilean Roberto Bolano and other South American literary greats, en route to Valparaiso. 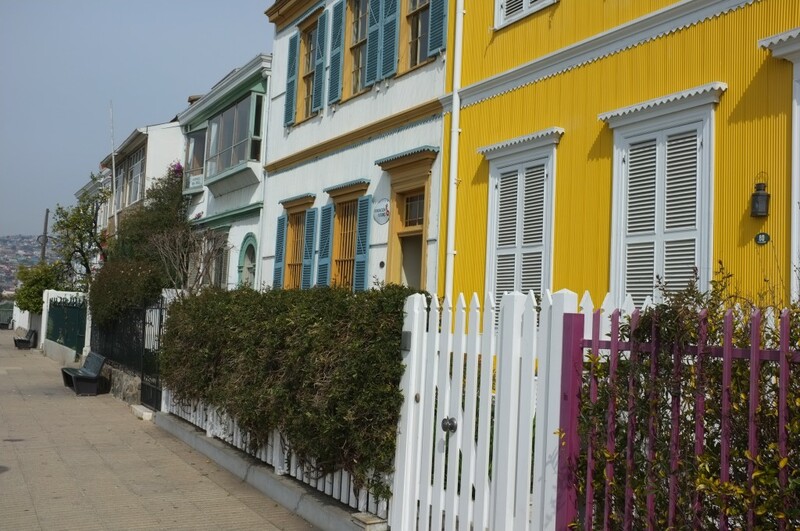 The colorful, hilly neighborhoods of this port city, whose decline began with the 1914 completion of the Panama Canal, make it one of the nation’s cultural treasures. Tear gas was in the air from the student and worker riots that day, so we left for the more bourgeois pleasures of nearby Vina del Mar, with its casino and luxury residences. Depleted physically and otherwise, I was quite ready to board the aircraft for my long overnight flight back to summer. To see more photos of Chile visit http://garyvinebergsphotos.shutterfly.com. WHEN I STARTED THIS BLOG I made an unstated commitment to post when moved to do so, instead of on a regularly scheduled basis. On the other hand, delving into the personal was one of the last things I intended. Yet here I am, baring my soul about a recent trip to China while it’s still alive in my aging memory. The opportunity to tour China arose because of the invitation of Susie, my high-school sweetheart and a good friend for most of the four and a half decades since we met in fifth grade. Susie’s base is Montreal but, as an executive with a global corporation, she and her family have lived abroad, in places as distant as South Africa and Poland. 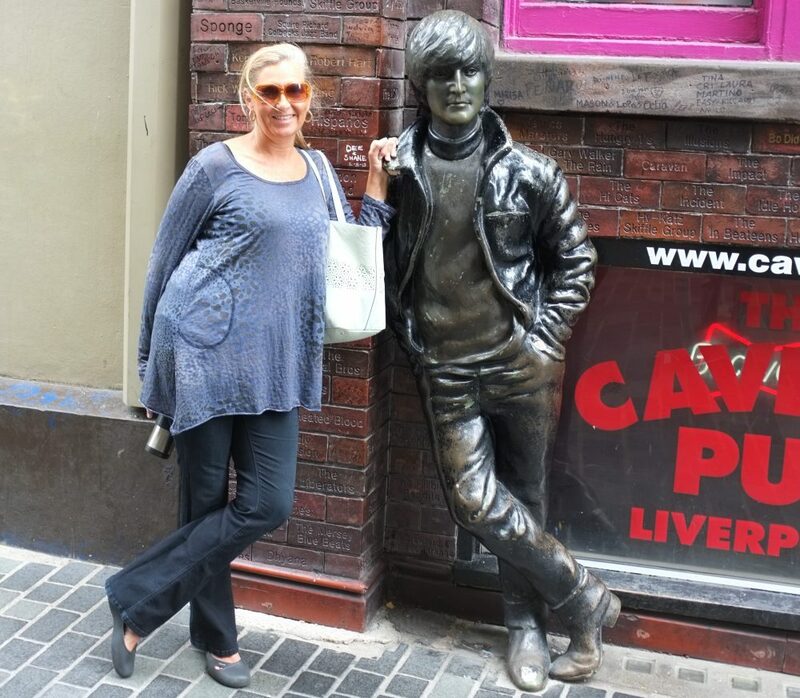 After her husband Daniel fell to cancer several years ago, she did a stint in my adopted home town of New York; her two children, Emily and Max, now adults and on their own, she’s currently stationed in Shanghai. 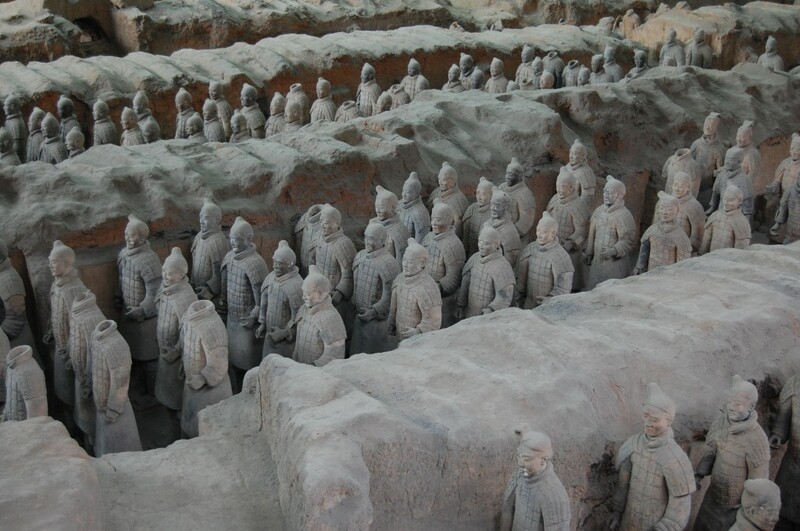 At her urging (and with a timely break in the parade of earnings announcements vital to my work as a securities analyst), I planned a 10-day visit that also took me to the historic cities of Suzhou, Xi’an and Beijing. Susie was a most gracious host, showing me the delights of China’s booming commercial metropolis: the dignified architecture of the Bund; Pudong’s pyrotechnical skyline across the Huangpu River; the French Concession, with its time-worn colonial residences where clothes hang outside to dry; the parks where groups of locals engage in singing and ballroom dancing, even matchmaking, all in public view. Shanghai is a great dining city too, and we enjoyed both Eastern and Western meals. There and on the journey ahead I would partake of juicy dumplings, lamb soup and Beijing duck, marveling from a safe distance at such novelties as roasted scorpion on a stick. 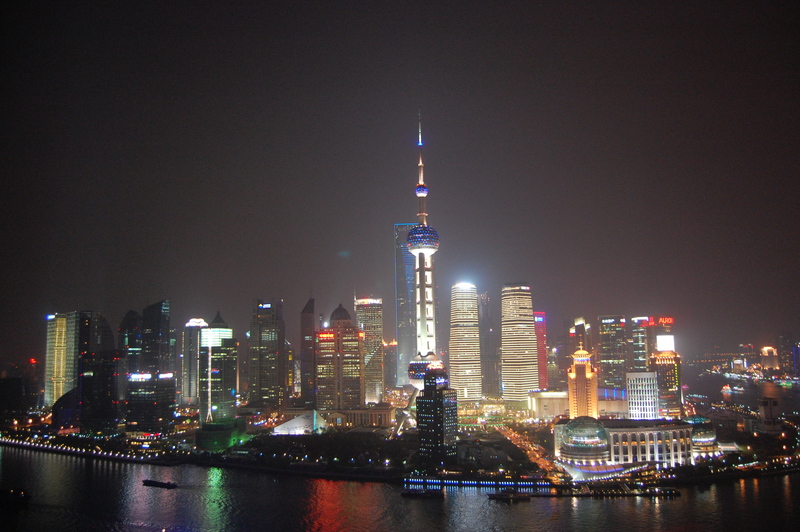 As Susie well knew, Shanghai is an ideal introduction to China for the novice, a place to get accustomed to its ways and recover from jet lag. To facilitate my journey onward she provided maps and papers with the addresses of hotels and restaurants written in English and Mandarin for the taxis, booked drivers to take me to outlying sites, even loaned me a China Mobile phone with a lifeline to her bilingual assistant Connie. I couldn’t have been more fortunate. Only five days remained, and I had a lot of ground to cover to see as many of the glories of this ancient land as possible. THE APRIL WEATHER was excellent for traveling: warm temperatures during the day and cool at night, with practically no rain during my entire stay. The semi-opaque air was another story entirely. According to different accounts I heard, it was dust blowing in from the Gobi Desert and fog mixed together, good old-fashioned pollution, or some other combination thereof. This was tolerable for breathing, worse for photography. In a China that is both rapidly modernizing and still under firm government control, I was almost unaware of the scandalous details regarding Bo Xilai, the deposed Communist Party chief of Chongqing. Our Western media have been captivated for weeks by this tale of corruption, wiretapping and notably Bo’s wife, Gu Kailai, portrayed by some as an Asian Lucrezia Borgia for her alleged poisoning of a British businessman. Still, political censorship in China is nowhere near as absolute as it used to be, and I had no problem staying current on all of the major events in business and sports. The everyday folk I encountered were never hostile, occasionally curious and friendly, but mostly indifferent to my presence. I rarely felt unsafe, nor did I even lose anything of value (other than the tube of toothpaste that Beijing airport security confiscated from me before boarding my flight back to the States). At the major destinations, mobs of Chinese tourists — who tend to spit loudly and often don’t respect another’s physical space — could be oppressive. Yet I understood that rising affluence has given many a first chance to discover their own country, which the American majority takes for granted. They’re in a hurry. A couple of flight delays that I endured were a minor inconvenience, never deterring me from my appointed rounds. To take in all the sights, sounds and smells without interference, I avoided tour guides, pedicabs and even taxis whenever possible. 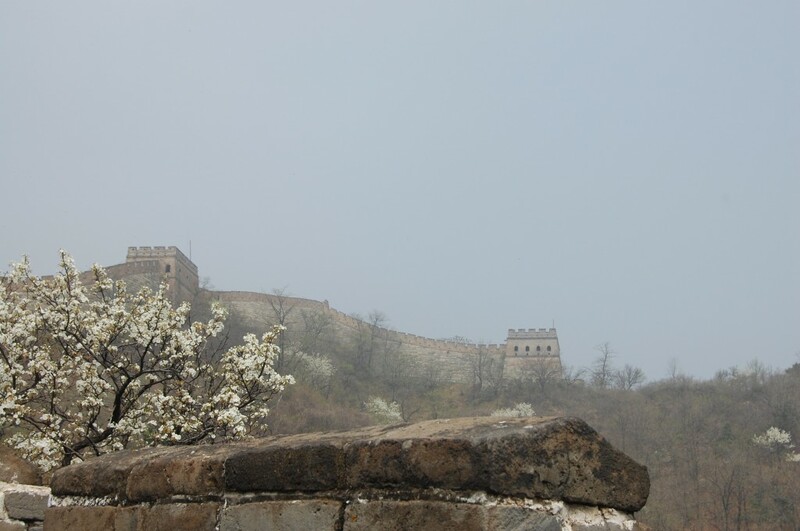 I walked until my feet, legs and back ached, along Suzhou’s old canals, in the Muslim souk of Xi’an at one end of the Silk Road, up and down the steep course of the Great Wall at Mutianyu, around the lakes of the Summer Palace and through the picturesque hutongs (alleys) of Beijing. So I hit all of the highlights on my route, and now could cross the China trip off my bucket list. But I had very little meaningful human contact in the final days, knowing only a handful of Mandarin words in a country where few outside the major hotels speak any English. Armed with a Nikon and an iPad, I brought home nearly 300 pictures of the trip and don’t have a single one with me in the frame. And here too, many people went about with earphones plugged into their music players, almost oblivious to anyone whose path they crossed. I might as well have been one of them. ON MY LAST DAY of sightseeing, I was fumbling with a pair of maps outside the north gate of Beijing’s Forbidden City, the enormous palace compound for two imperial dynasties, when a woman’s voice asked me from behind where I was from. Turning around, I told her I was American. She was of a younger but indeterminate age, with a sweet, sad face that seemed to me more Mongolian than Han Chinese. 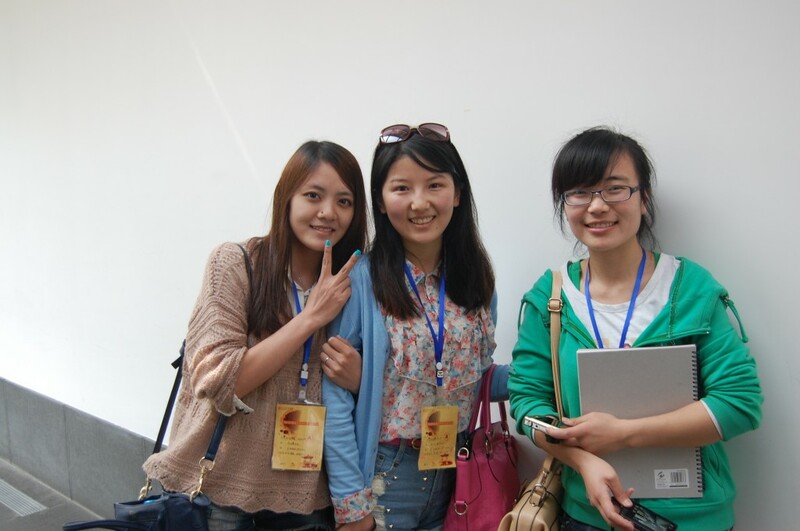 Petite and conservatively dressed, she said she was visiting from Harbin, a city in the extreme northeast of China. There, she told me, I would be one of the few Westerners anybody ever sees, other than the odd Russian. 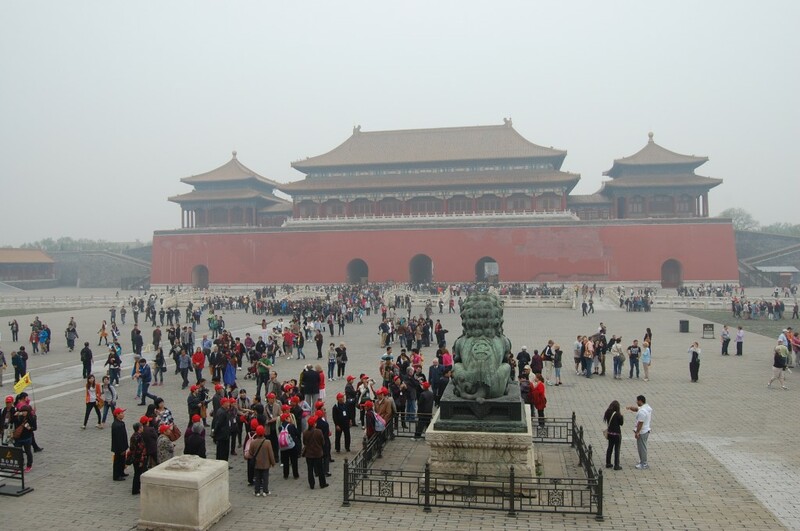 The woman said she had spent three hours in the Forbidden City; I had spent four. But I will never know anything more about her, except for what my imagination conjures up. When a 55-year-old man is approached like that by an unfamiliar woman, it’s natural for his guard to go up. This was out of the question. She was too aggressive, her English ability suspicious. I had a lovely wife waiting for me at home. There was no time. “Look,” I said, “I’m leaving early tomorrow and I only have a few hours left to see Beijing. I need to finish my walking tour. But it was very nice meeting you.” After shaking her hand I rambled off toward Prince Gong’s residence, which turned out to be a beautifully restored, scaled-down Forbidden City, overwhelmed by tour groups. By the next morning the woman was beginning to haunt me. What was she hustling me for: a sugar-daddy night on the town, a Green Card? Or maybe she was just a more mature version of the schoolgirls on an outing to the Suzhou Museum who asked me, an exotic American, to pose for pictures with them, wanting just to practice English with a native speaker. She was a human-rights activist trying to recruit me, perhaps, or a government agent posing as one. Did I really want to find out? I, who never missed taking a pill the entire trip, tracks his personal net worth in real time, works out at the gym every two days and logs in his activities, pictured myself as a Prufrock, measuring “out my life with coffee spoons.” I switched from T.S. Eliot to Henrik Ibsen (“When we dead awaken.… We see that we have never lived”) before my cliché alarm sounded. Still, didn’t my drive and self-discipline ultimately afford me the wherewithal and savvy to arrange (with Susie’s invaluable help) such an adventure on short notice? Haven’t I visited dozens of countries and connected with people all over the world? Shortly, like Odysseus, I would be returning home to my Ithaca, my Penelope, where all would be right – and that alarm went off again. On the final flight leg back to New York from San Francisco, I went into the aircraft lavatory and spontaneously cried. It bewildered me, because I had been so pleased with everything, but for a moment the tears washed away a lifetime of jadedness. Soon enough she will fade from my recollection; I’m already having trouble visualizing her face. But the China trip could’ve been perfect. What would I have risked to spend a half hour with a diminutive stranger who braved rejection to meet me? Why didn’t I join the woman from Harbin for a cup of coffee? To see more photos of China visit http://garyvinebergsphotos.shutterfly.com. For his largesse, David gets to keep his name on the theater for at least 50 years, after which his family has the right of first refusal for any renaming. I can appreciate the commercial value to a major corporation putting its brand on a sports stadium, but he bought something more akin to immortality. It’s well known that moderate billionaires like Warren Buffett and Bill Gates are extremely charitable as well as civic-minded enough to welcome substantial taxation on their estates. The so-called Buffett Rule even calls for a minimum federal tax rate of at least 30% on those earning $1 million and more per year. However, others to their right on the political spectrum – and at the far end of the vanity scale — seem to want more than patriotic pride for their money, specifically by seeing their names emblazoned on large objects. Please don’t get me started on Donald Trump. Naturally, business schools at prestigious colleges are a favorite. I earned my M.B.A. from New York University at the strictly utilitarian Graduate School of Business Administration (or G.B.A.) near the American Stock Exchange building behind Trinity Church. Thanks to a $30 million gift, a year after my 1987 graduation, from a grateful alumnus who made it big in pet products and real estate, the renamed Leonard N. Stern School of Business moved to nifty new digs near Washington Square four years later. Its facilities now include Tisch Hall, the Henry Kaufman Management Center, and the John A. Paulson Auditorium. 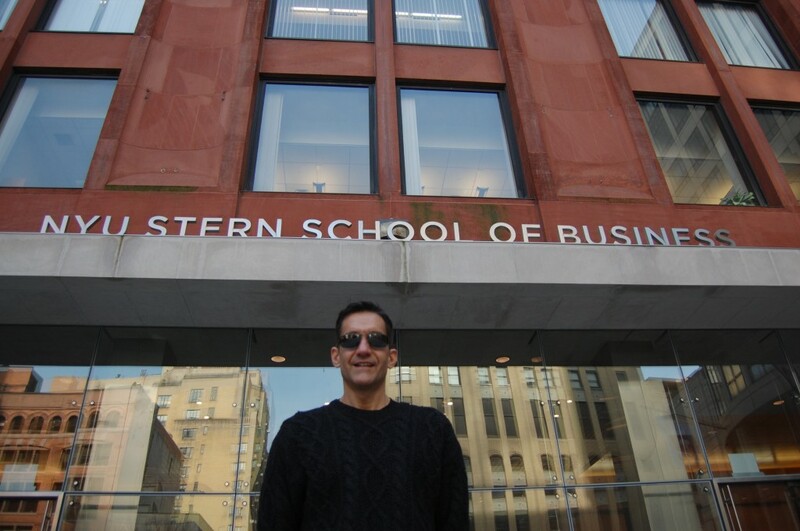 Had I attended a couple of decades later, I would have been a student in the Langone part-time M.B.A. program. In this respect, our local, state and federal governments have missed the proverbial boat. The United States Navy commands 11 active aircraft carriers: the Enterprise, Nimitz, Dwight D. Eisenhower, Carl Vinson, Theodore Roosevelt, Abraham Lincoln, George Washington, John C. Stennis, Harry S. Truman, Ronald Reagan, and George H.W. Bush; under construction are the Gerald R. Ford and John F. Kennedy. Many things are named after the late Senator Strom Thurmond in his native South Carolina, including a reservoir lake, despite a lengthy political career undistinguished by notable legislation but widely remembered for pork and his lone 24-hour filibuster against the Civil Rights Act of 1957. Why do we so honor dead and former presidents, military leaders and Southern segregationists (which Vinson, Stennis and Thurmond all were) instead of the great citizens who foot much of the bill? I say, for the sake of the country and to cool their anti-government fervor, let’s recognize our largest (and most egotistical) taxpayers. New York’s three-term mayor Michael Bloomberg solved the problem himself by going into politics; his name will almost certainly grace public property when the Bloomberg terminal is already Wall Street nostalgia. Perhaps Mitt Romney will enjoy the same fate. (Maybe this is why Donald Trump keeps flirting with a presidential run.) But what about the rest? Washington boasts a massive inventory of cool, expensive items on which to stencil a worthy name, among them intercontinental ballistic and cruise missiles, strategic bombers and drones. What right-wing Texas oil baron wouldn’t want his handle on the warhead that atomized an Iranian uranium-enrichment facility, driving the price of crude up to unprecedented levels? Yet private-equity tycoon Stephen Schwarzman might be more flattered by a chunk of the Library of Congress. After all, the New York Public Library renamed its landmark edifice on Fifth Avenue and 42nd Street a few years ago as the Stephen A. Schwarzman Building for his $100 million donation. If only he would stop demagoguing the president’s plan to tax carried interest as ordinary income (at 35%) instead of long-term capital gains (at 15%) – which Schwarzman once equated with the Nazis’ 1939 invasion of Poland. On the surface of it, Mark Zuckerberg’s potential bill of more than $1.5 billion from the Internal Revenue Service for exercising Facebook options would seem to warrant a tribute as great as, say, the Capitol. However, the company’s deductions for option compensation could eliminate its own tax liabilities for years. Still, that particular loophole isn’t Zuckerberg’s fault, and we’ve got to start somewhere if we’re going to get our house back in order. Imagine a hop-on-hop-off, double-decker bus tour of the national capital that stopped at the Mark E. Zuckerberg Capitol building, the Warren E. Buffett White House (assuming the current occupant’s re-election, of course), the William H. Gates III National Archives, the Walton Family Pentagon building, and the Koch Brothers Washington Monument. Even the most ardent anti-taxation oligarch couldn’t resist ego gratification of that magnitude. There are other means to win over billionaires to the cause of government, and by that I don’t mean handing out mere awards. No, I was actually thinking about restoring titles of nobility. Knighthood always impressed me as an especially cost-effective way for the British monarchy to co-opt republicans and other possible troublemakers for the crown. “Sir Donald” has a nice ring to it, wouldn’t he say?